Today I saw the oddest advertisement for Yushi Bento Bar, a Japanese restaurant in New York. Floating down 8th Avenue was a balloon that read “Don’t Balloon this Summer! Yushi.” I believe they were trying to say something like, “Don’t get fat over summer, you disgusting pigs. Eat sushi at Yushi and stay lean.” But somehow, I’m not sure it got across. Interestingly enough, the balloon holder was stopped by a police officer and asked for identification and a permit to float the balloon down the street. When I first saw the balloon, it was actually floating down the middle of the street! Then, as the officer approached, the balloon holder was escorted to the sidewalk. 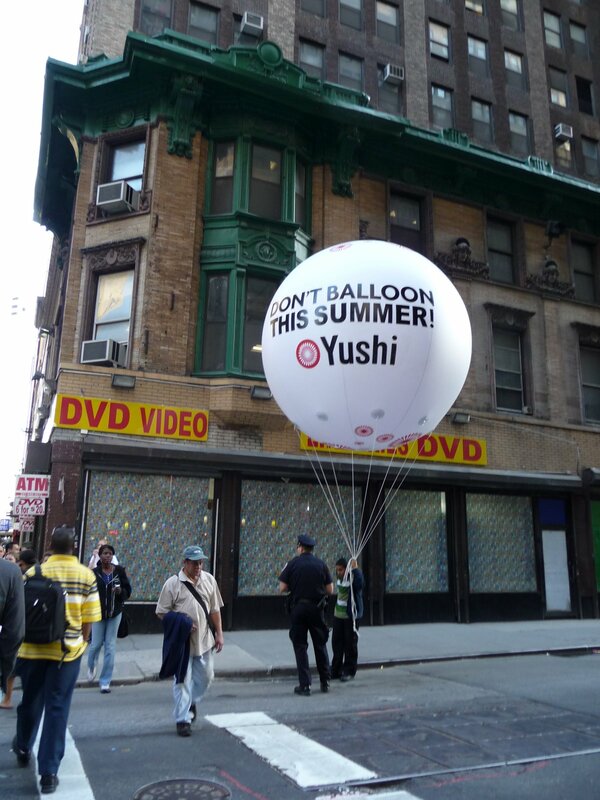 I’m not sure exactly how effective the balloon is, though, because it says nothing about what Yushi is. The only reason I looked it up was because I’m an advertising fiend. Hopefully it turns out for the best. And if anything, I was just excited to chase a balloon down 8th Avenue to catch this picture! ← I’m a Gilman Scholar! Are you?